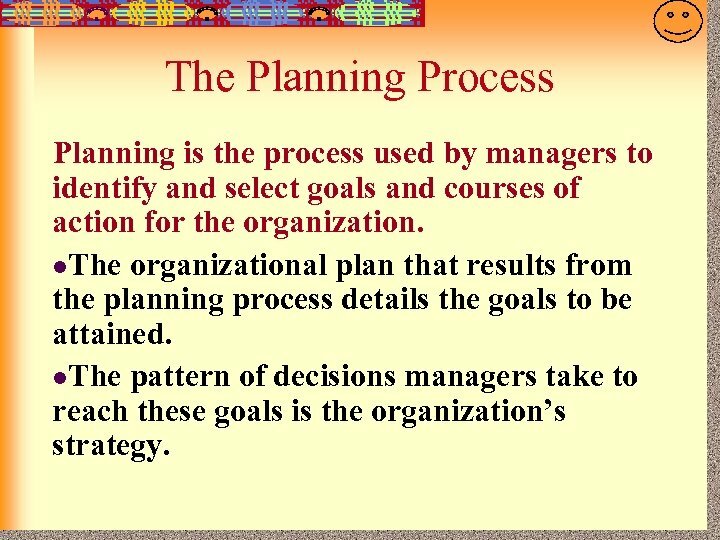 7 -3 The Planning Process Planning is the process used by managers to identify and select goals and courses of action for the organization. 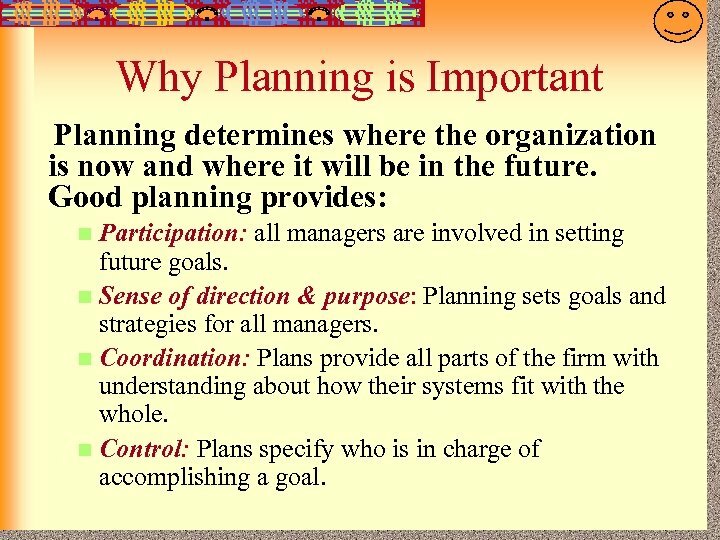 l. The organizational plan that results from the planning process details the goals to be attained. 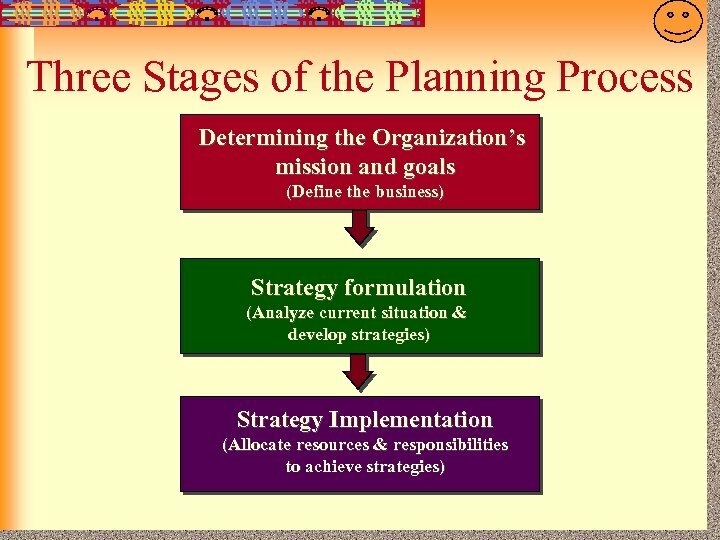 l. The pattern of decisions managers take to reach these goals is the organization’s strategy. 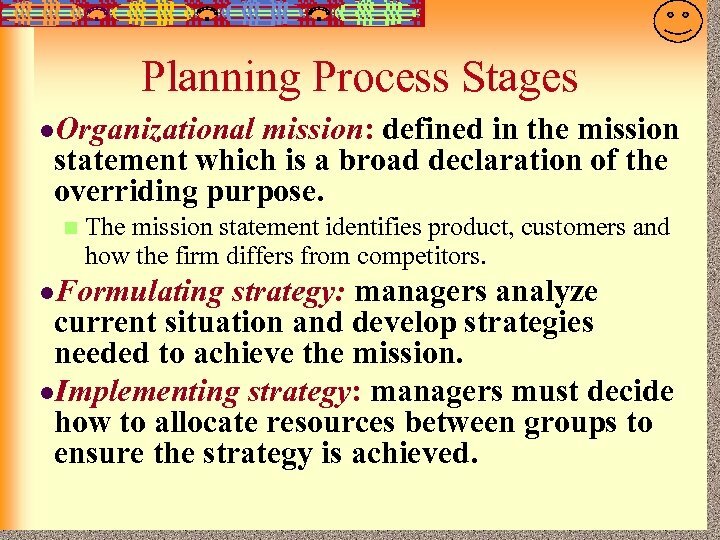 7 -5 Planning Process Stages l. Organizational mission: defined in the mission statement which is a broad declaration of the overriding purpose. 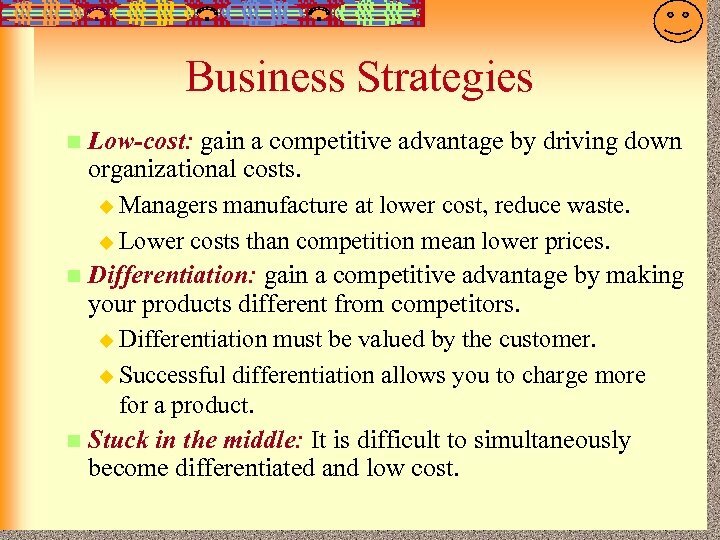 n The mission statement identifies product, customers and how the firm differs from competitors. 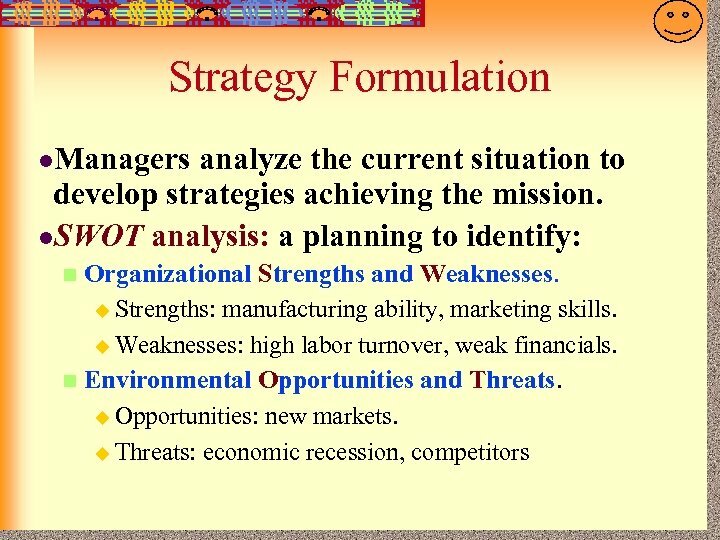 l. Formulating strategy: managers analyze current situation and develop strategies needed to achieve the mission. 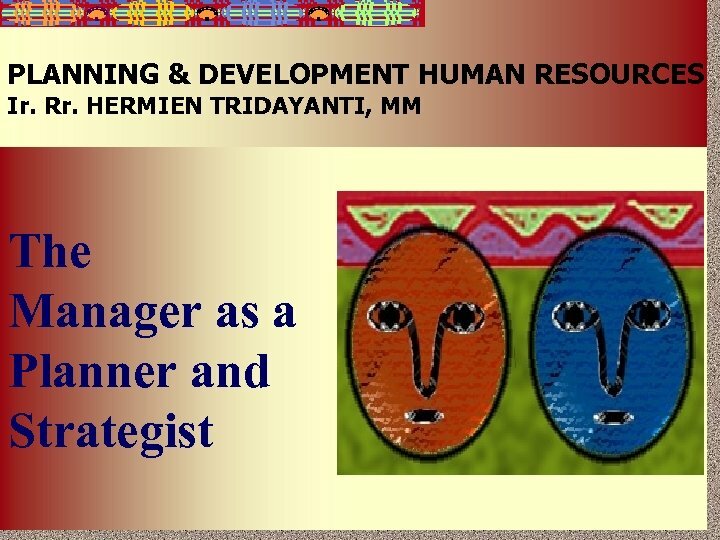 l. Implementing strategy: managers must decide how to allocate resources between groups to ensure the strategy is achieved. 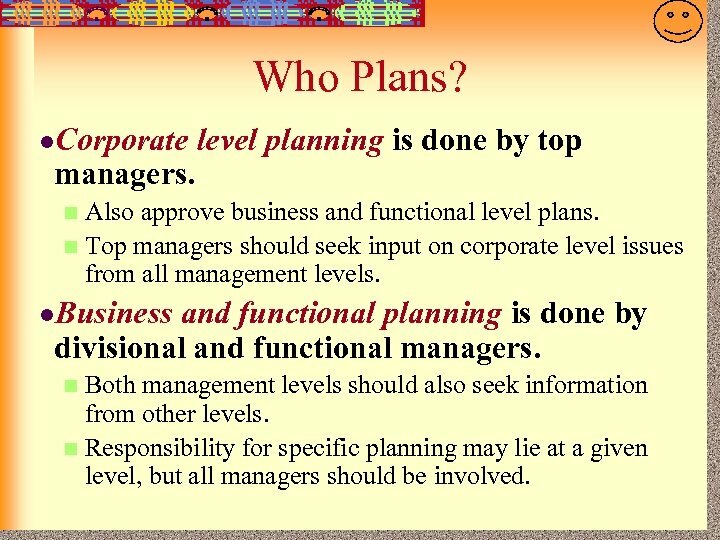 7 -8 Planning Levels l. Corporate-level: decisions by top managers. Considers on which businesses or markets to be in. 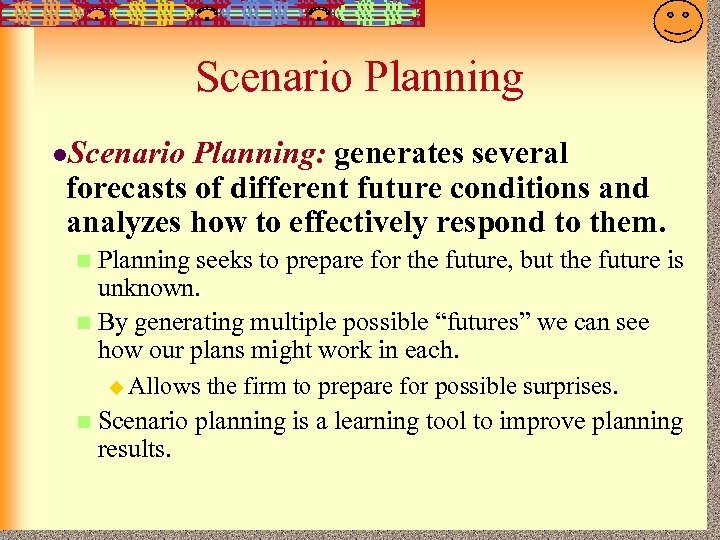 n Provides a framework for all other planning. 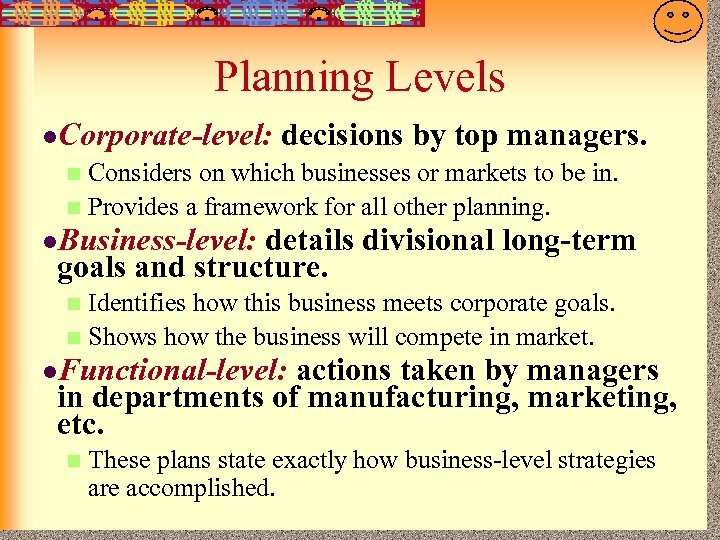 n l. Business-level: details divisional long-term goals and structure. Identifies how this business meets corporate goals. 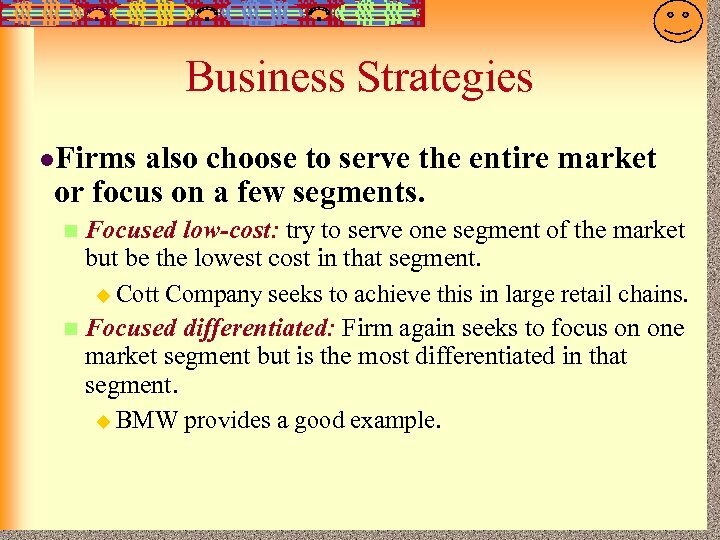 n Shows how the business will compete in market. 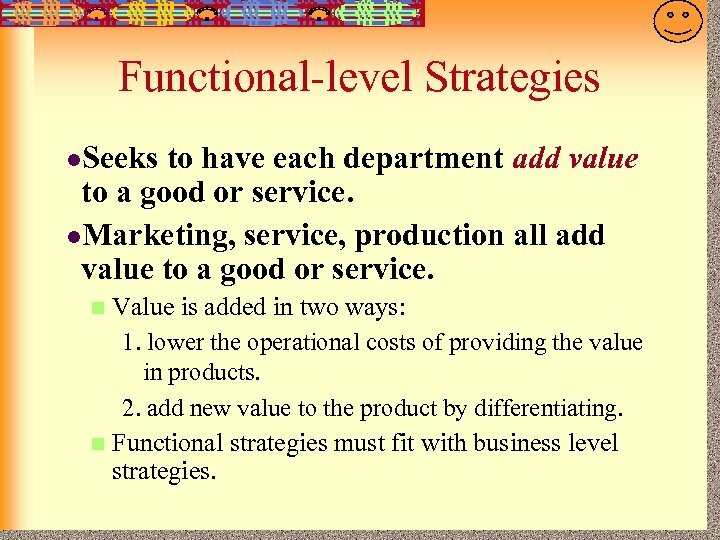 n l. Functional-level: actions taken by managers in departments of manufacturing, marketing, etc. 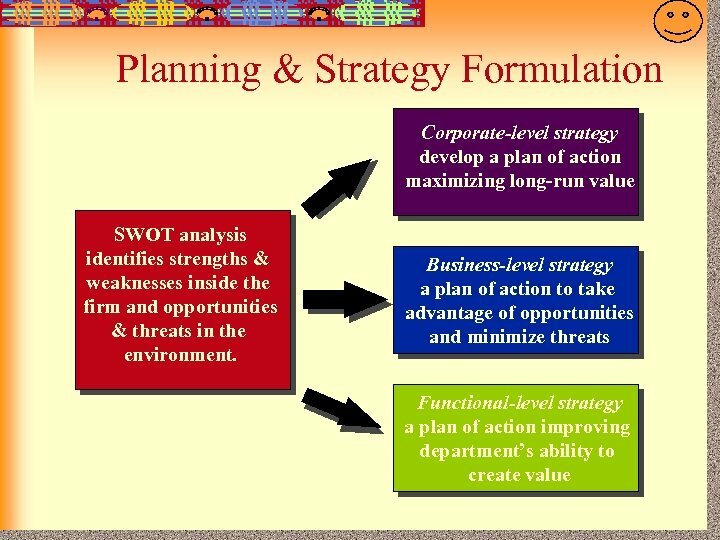 n These plans state exactly how business-level strategies are accomplished. 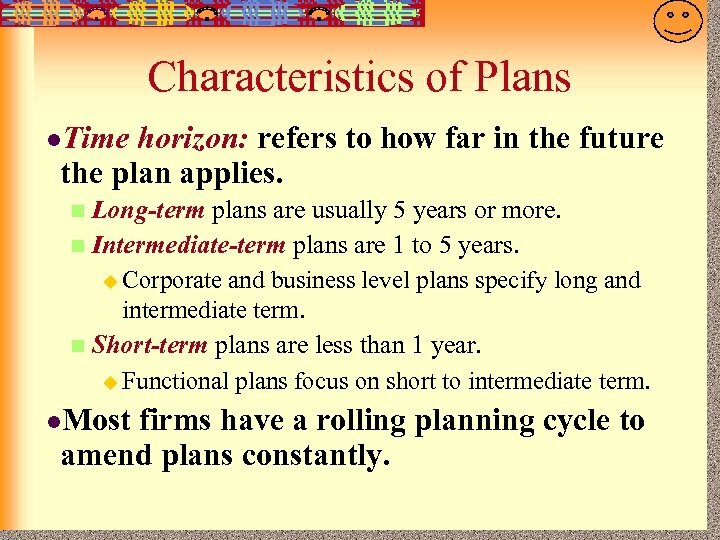 7 -9 Characteristics of Plans l. Time horizon: refers to how far in the future the plan applies. Long-term plans are usually 5 years or more. n Intermediate-term plans are 1 to 5 years. 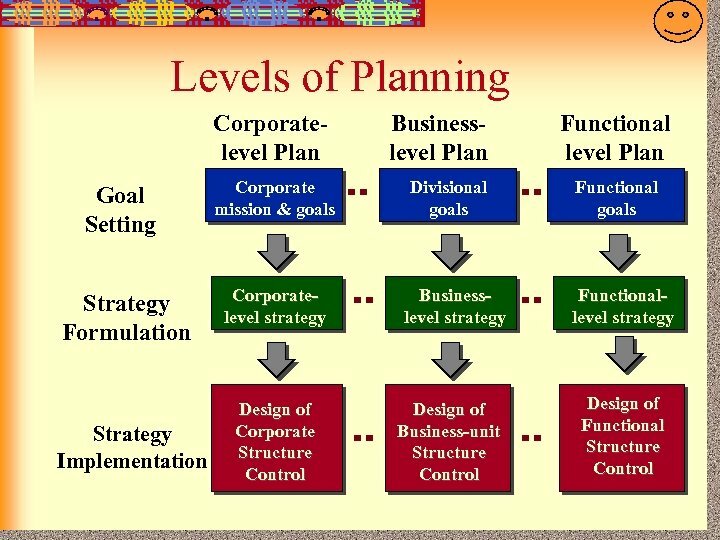 u Corporate and business level plans specify long and intermediate term. n Short-term plans are less than 1 year. u Functional plans focus on short to intermediate term. 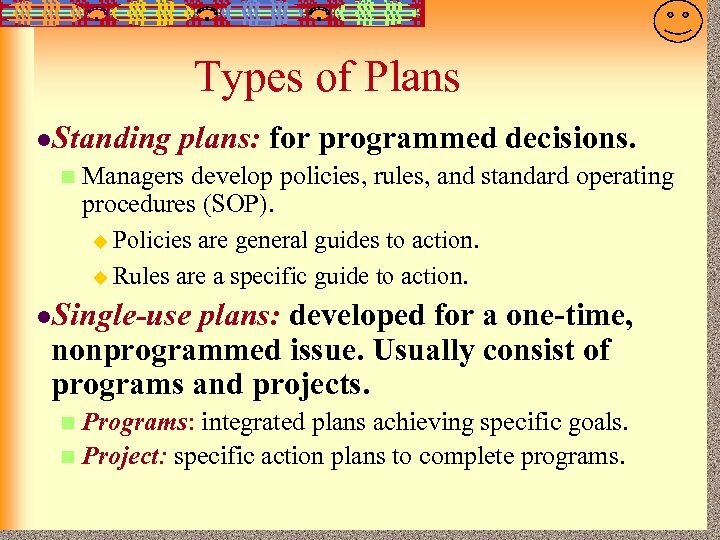 n l. Most firms have a rolling planning cycle to amend plans constantly. 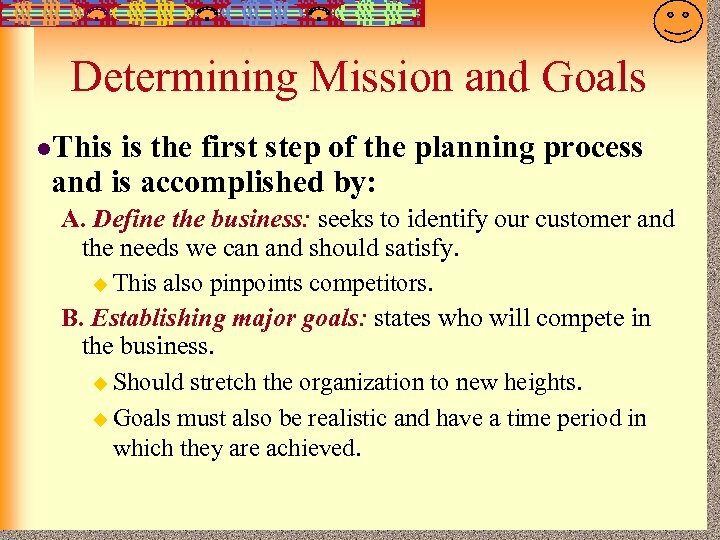 7 -15 Determining Mission and Goals l. This is the first step of the planning process and is accomplished by: A. Define the business: seeks to identify our customer and the needs we can and should satisfy. u This also pinpoints competitors. B. 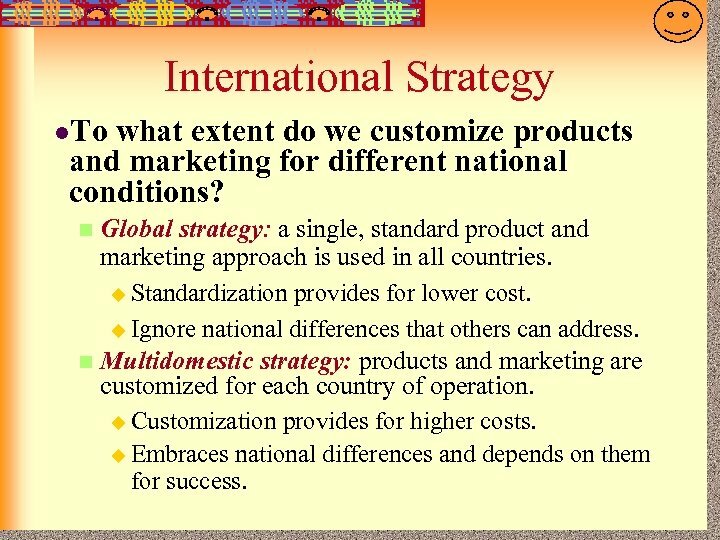 Establishing major goals: states who will compete in the business. 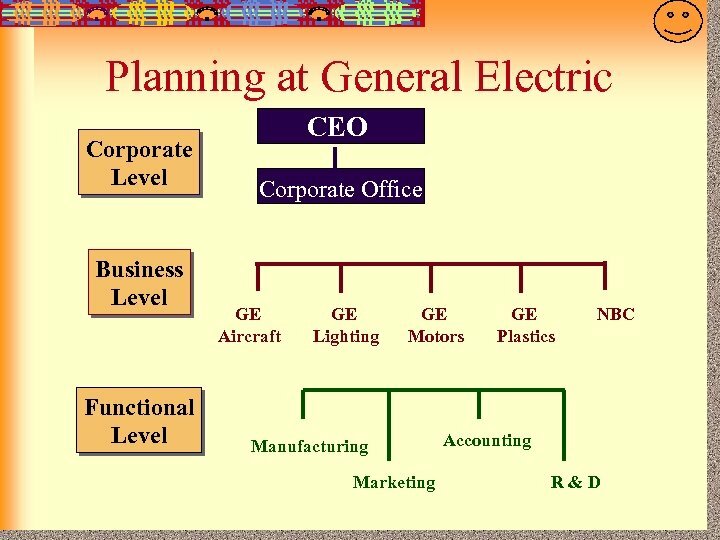 u Should stretch the organization to new heights. u Goals must also be realistic and have a time period in which they are achieved. 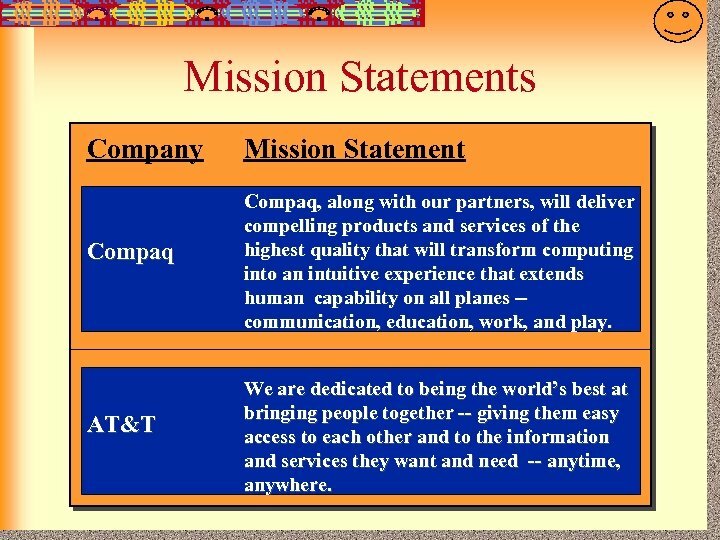 7 -16 Mission Statements Company Mission Statement Compaq, along with our partners, will deliver compelling products and services of the highest quality that will transform computing into an intuitive experience that extends human capability on all planes -communication, education, work, and play. AT&T We are dedicated to being the world’s best at bringing people together -- giving them easy access to each other and to the information and services they want and need -- anytime, anywhere. 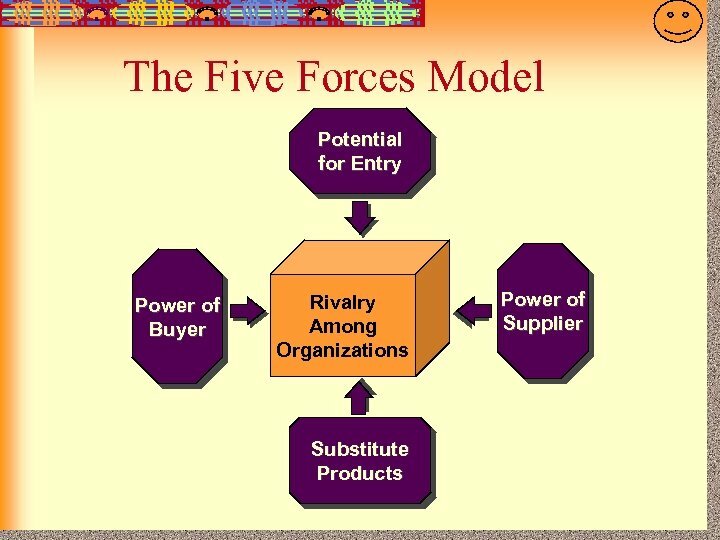 7 -20 The Five Forces 1. 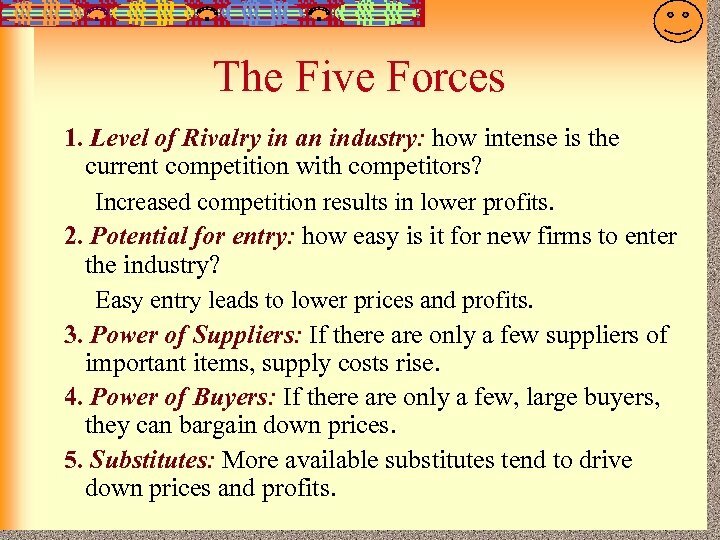 Level of Rivalry in an industry: how intense is the current competition with competitors? Increased competition results in lower profits. 2. Potential for entry: how easy is it for new firms to enter the industry? Easy entry leads to lower prices and profits. 3. 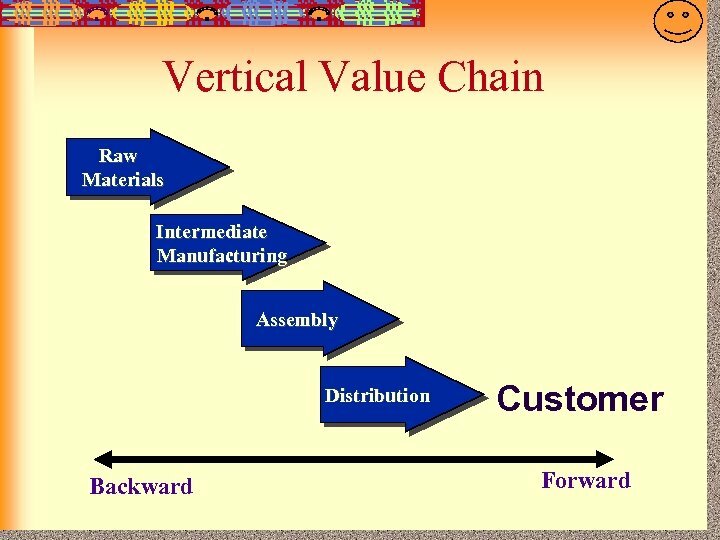 Power of Suppliers: If there are only a few suppliers of important items, supply costs rise. 4. Power of Buyers: If there are only a few, large buyers, they can bargain down prices. 5. Substitutes: More available substitutes tend to drive down prices and profits. 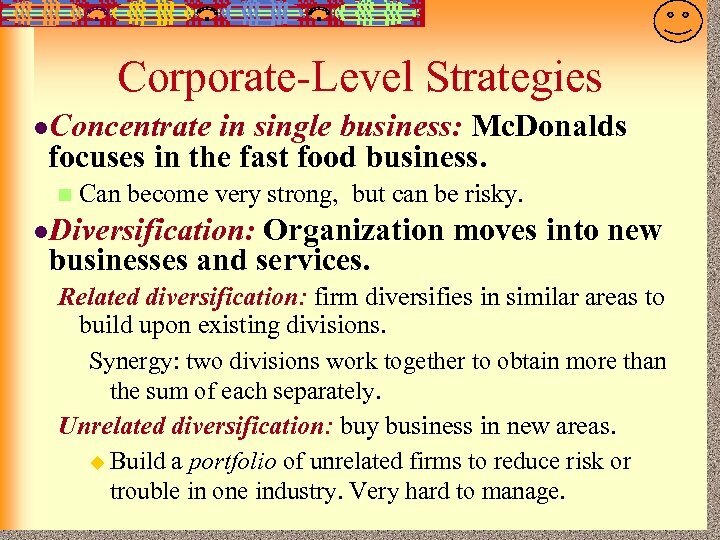 7 -21 Corporate-Level Strategies l. Concentrate in single business: Mc. 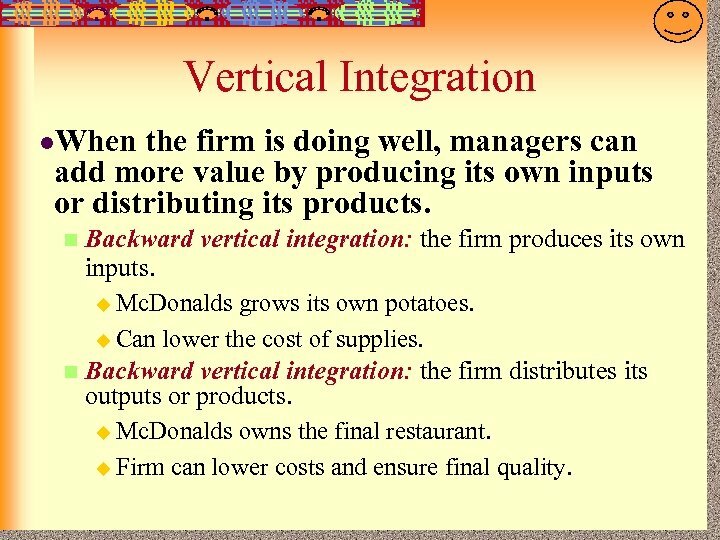 Donalds focuses in the fast food business. n Can become very strong, but can be risky. l. Diversification: Organization moves into new businesses and services. 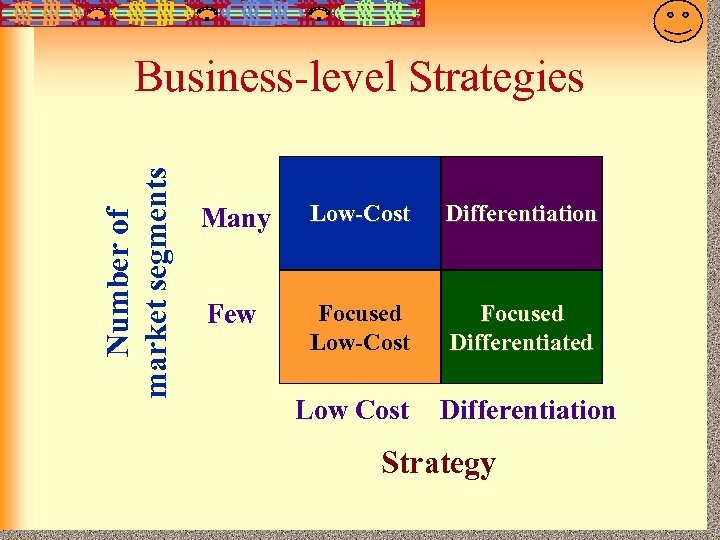 Related diversification: firm diversifies in similar areas to build upon existing divisions. Synergy: two divisions work together to obtain more than the sum of each separately. Unrelated diversification: buy business in new areas. u Build a portfolio of unrelated firms to reduce risk or trouble in one industry. Very hard to manage. 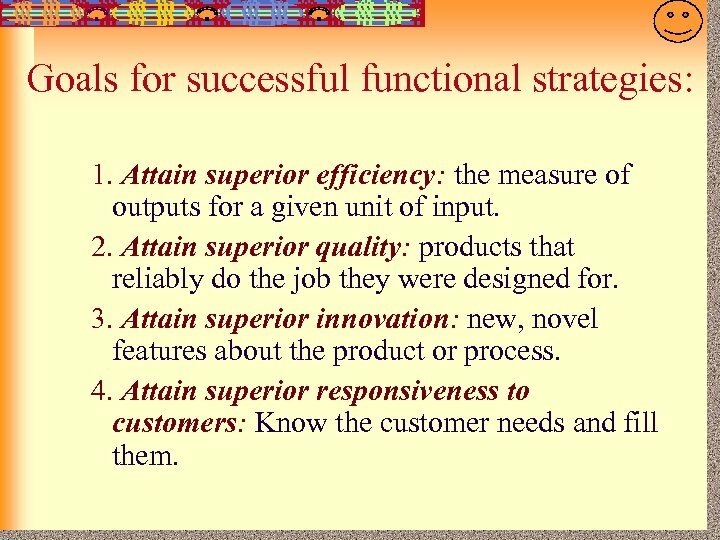 7 -29 Goals for successful functional strategies: 1. Attain superior efficiency: the measure of outputs for a given unit of input. 2. Attain superior quality: products that reliably do the job they were designed for. 3. Attain superior innovation: new, novel features about the product or process. 4. Attain superior responsiveness to customers: Know the customer needs and fill them.